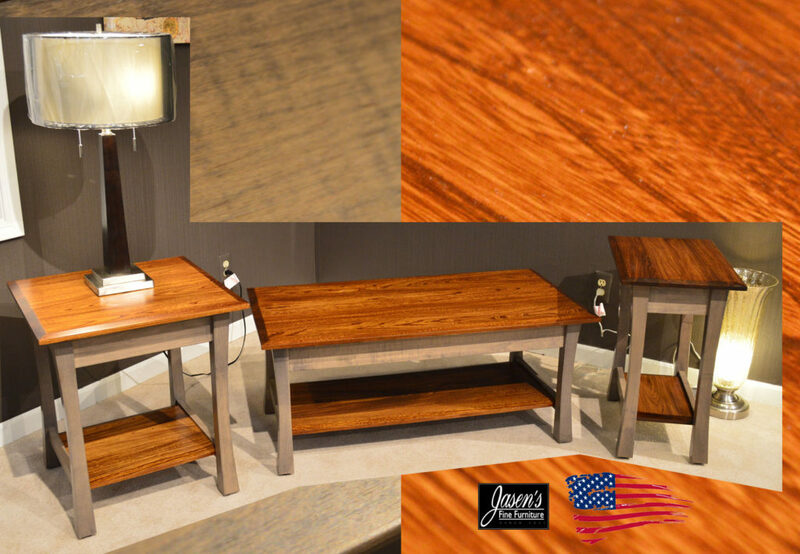 Amish Enclosed Tables feature tapered legs, beveled edges, and fully enclosed for maximum storage. The drawers are dovetailed and feature full extension ball glide extensions for long lasting use and easy access to all contents. 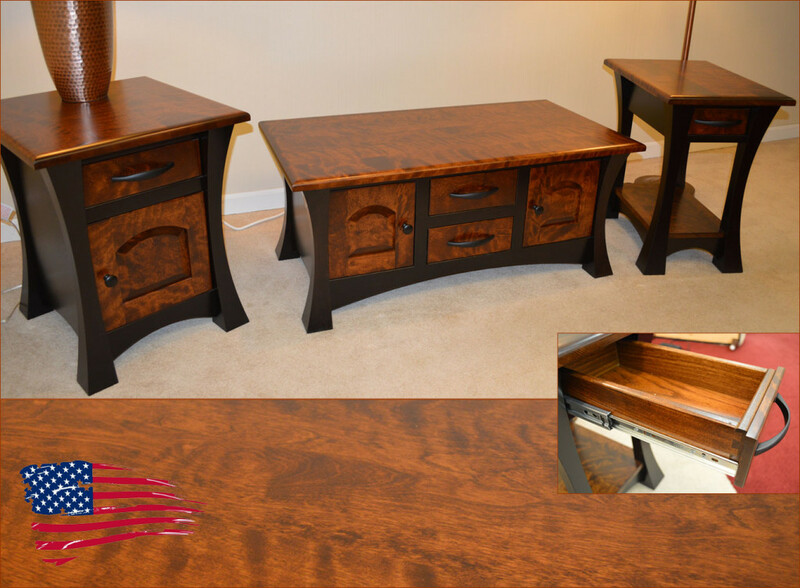 Pieces can be ordered in your custom sizes, many wood species, stains, and hardware! Made in USA! 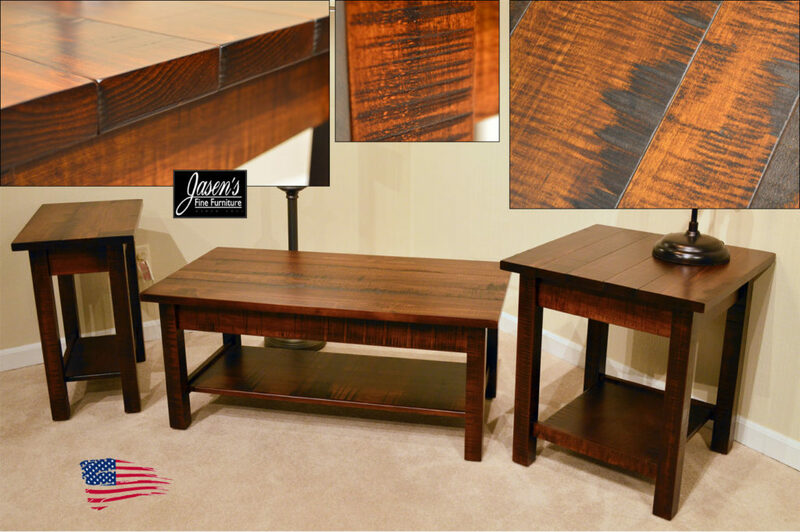 Amish Metro Tables feature unique Elm wood that has a feather style grain. The tables feature fan-like mullions on the side in homage to the dining chair style it hails from. Available in your specific sizing, wood species, and hardware! Made in USA! 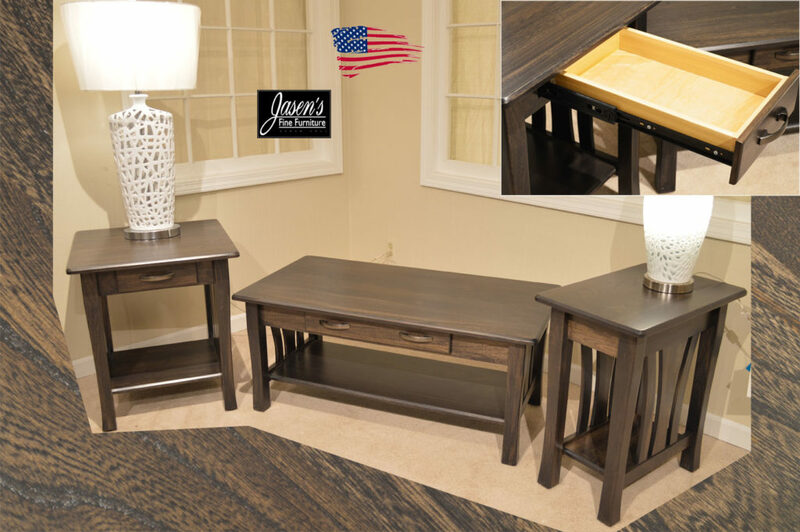 Michigan Curved Leg Tables feature bombay style legs with clipped corner tops and full extension ball glide drawers. Shown in maple with Burnt Umber stain and brushed copper pulls. Available in your custom sizing, colors, and hardware! 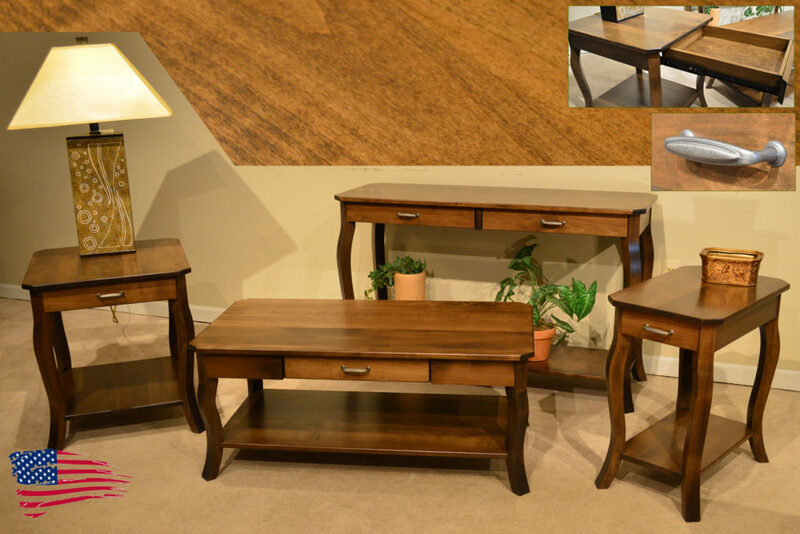 Amish Husk Tables feature high tapered legs, contemporary style, and solid Brown Maple construction. Tables all come standard with dovetailed drawers on full extension glides. You can order the tables in any sizes and drawer configurations of your choice. There are also many other pieces and sizes available for order in the collection. 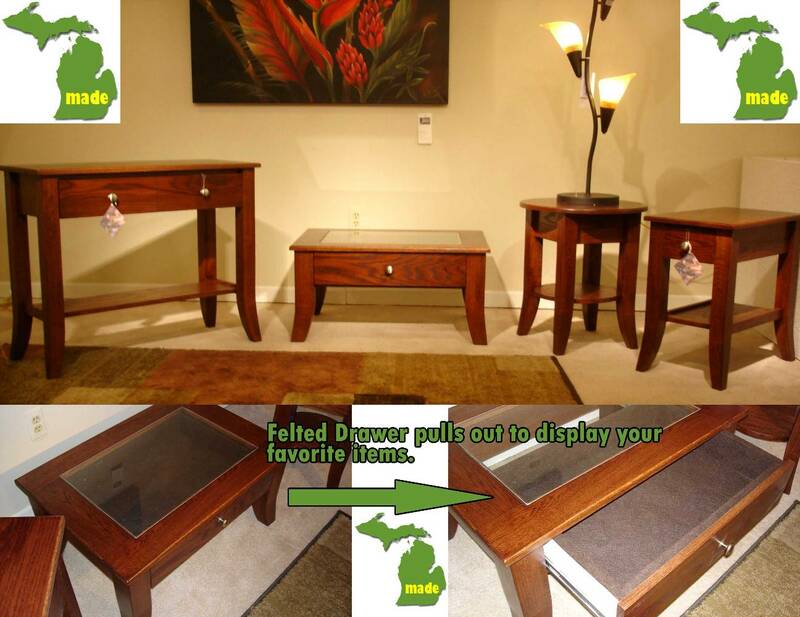 The tables can be ordered in any wood specie, stain, hardware, and sizes of your choice. 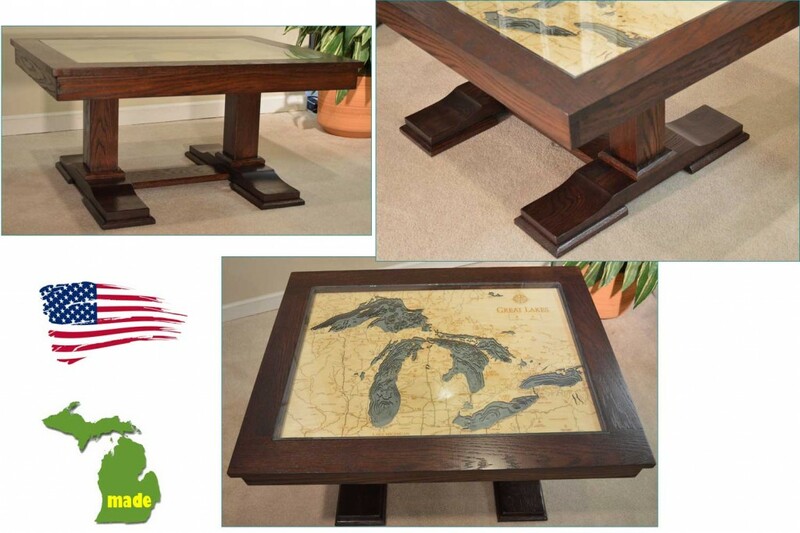 Finally, the tables are Amish made, hence made in the USA! 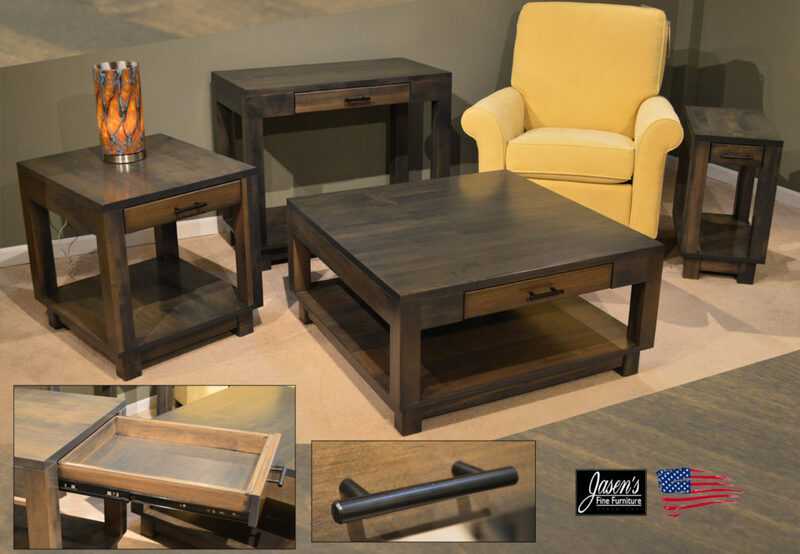 Michigan Huron Gray tables feature practical, yet edgy styling with it's clean lines and modern gray stain. The tables come standard with full extension glides for all drawers for long lasting use. The drawers are all dovetailed box construction and the hardware featured has a rustic charm. 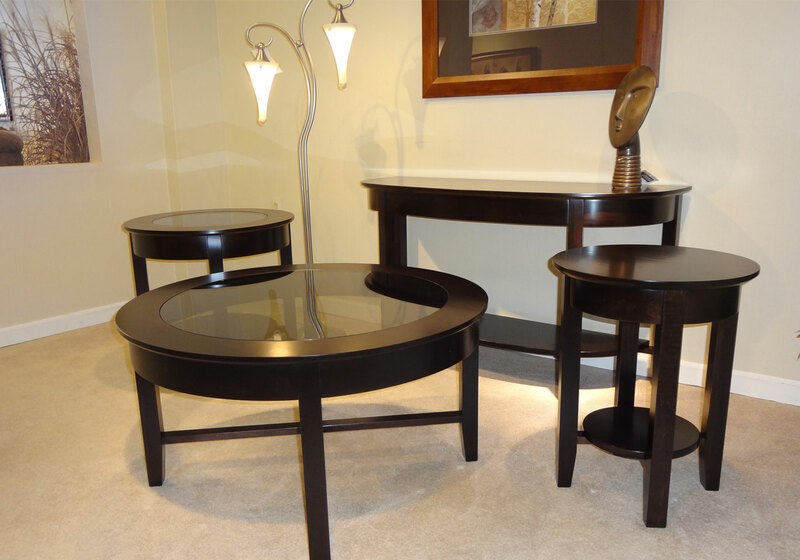 The tables can be ordered in any size, stain, and hardware of your choice! Made in Michigan! 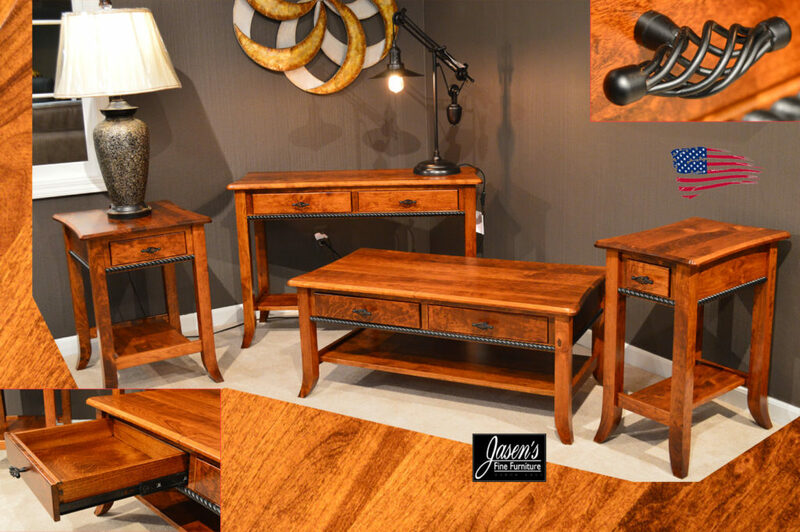 Chairside Chest: H-25" W-17" D-27"
Sofa Table: H-30" W-32" D-17"
Coffee Table: H-19" W-41" D-25"
Chairside Table: H-25" W-17" D-27"
The Amish Carlisle tables feature solid rustic cherry construction with full extension glide drawers on each piece. Other features include the ebony rope that adds to the charm as well as the ribbon twist black hardware. The group features a unique inverse bowed top shape with beveling on all sides. Tables can be ordered without the rope and in dozens of wood specie and stains. In addition, the group can also be ordered in any sizing, specifications, and with 100's of different hardware. Made in USA by real Amish craftsmen! 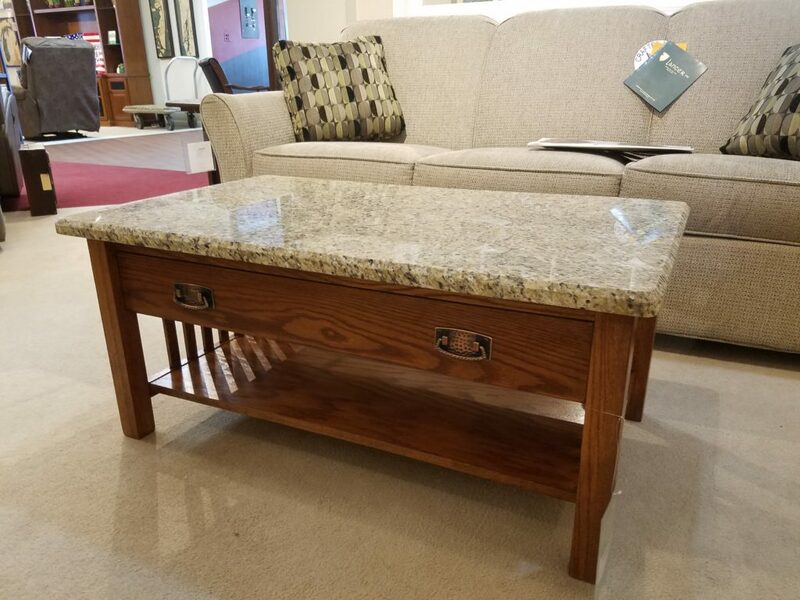 Chairside Table: H-26" W-14" D-21"
End Table: H-26" W-19" D-21"
Coffee Table: H-18" W-41.5" D-22"
Sofa Table: H-28.5" W-42" D-16"
These tables feature a casual rustic style that will suit any home with a lot of character! 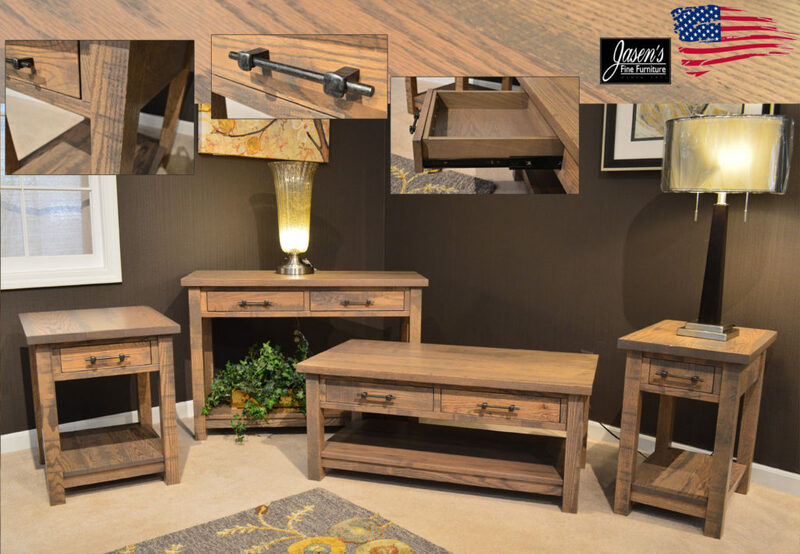 The 1" thick tops feature a plank design for a true barn floor look. 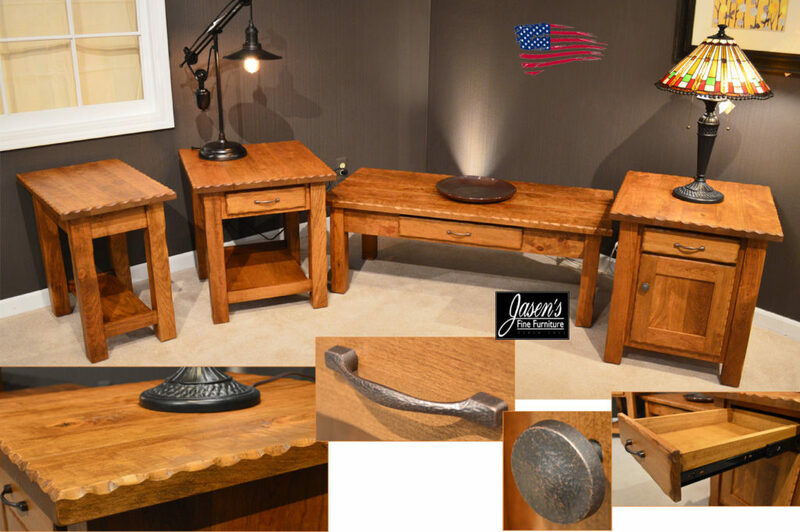 Each piece has randomly placed mill marks for rich rustic detail. Shown in brown maple with a golden brown stain, but can be ordered in dozens of stain colors as well as other wood specie. Other wood species available include, but are not limited to Cherry, Oak, and Quarter Sawn White Oak. 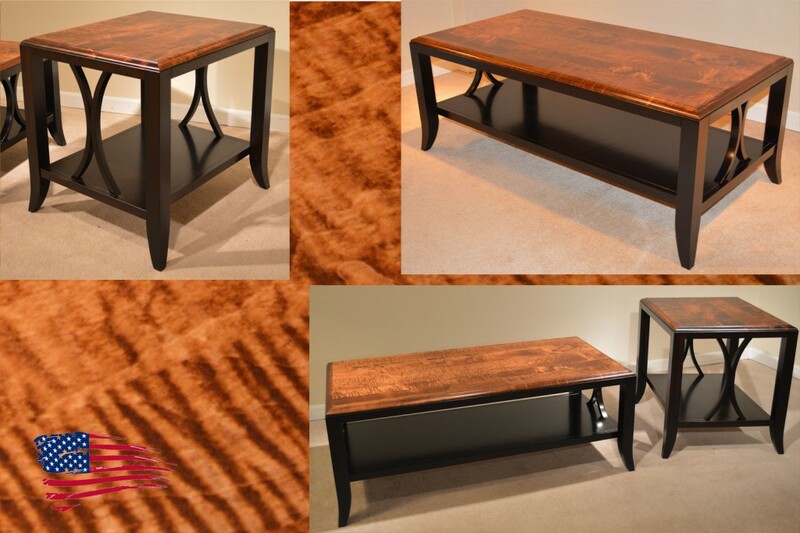 The tables can also be made to your specifications for size as well as adding drawers. If drawers are added there are almost limitless options in hardware! Made in the USA by real Amish Craftsmen. 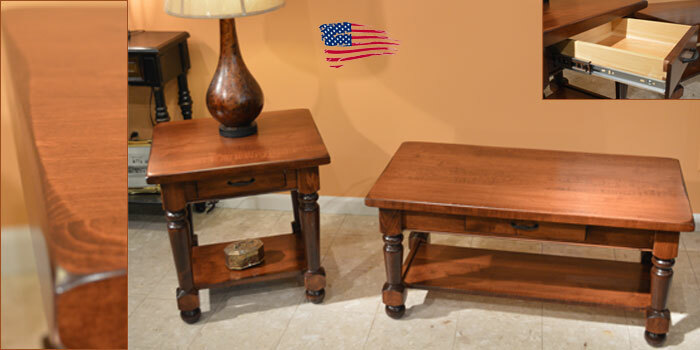 Chairside Table: H-24.5" W-14" D-22"
End Table: H-24.5" W-22" D-24"
Coffee Table: H-18.5" W-42" D-22"
These unique tables feature Solid Elm tops and shelves with beveled edges and unique "Dark Knight" stain. The frames are constructed of solid Brown Maple with contrasting Grey stain that has a hint of gold. 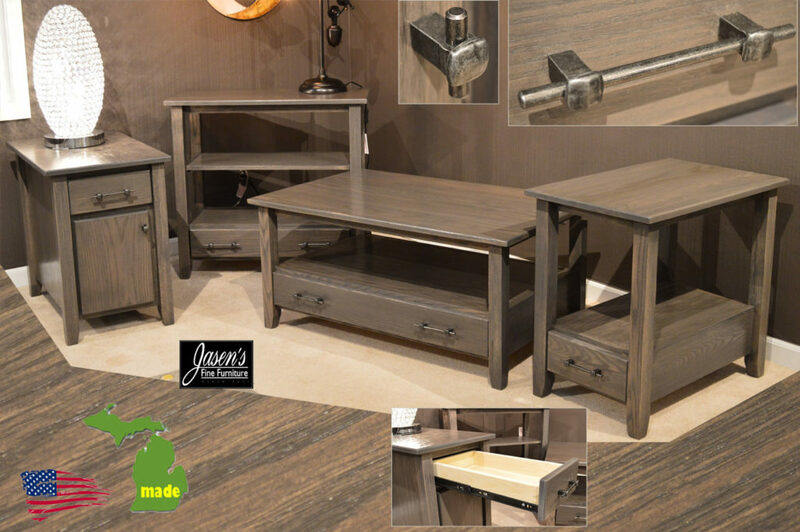 The tables are also available in your size specifications, wood specie and stain, and choice of hardware if drawers are added! 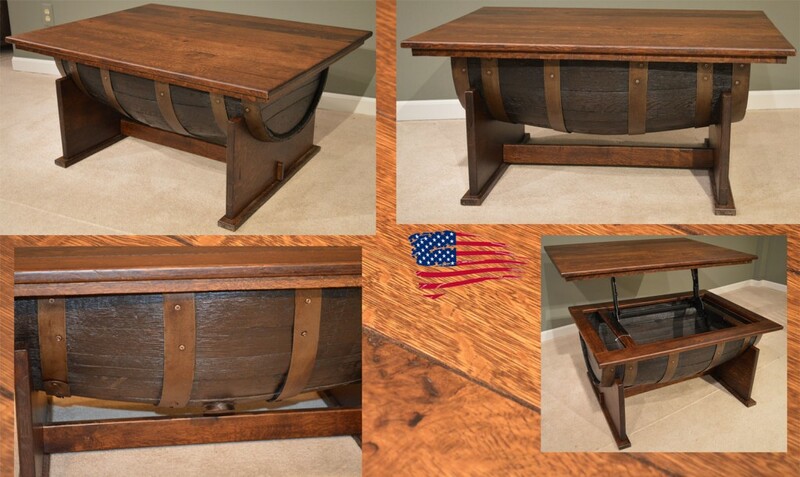 Made in USA by Amish craftsmen. 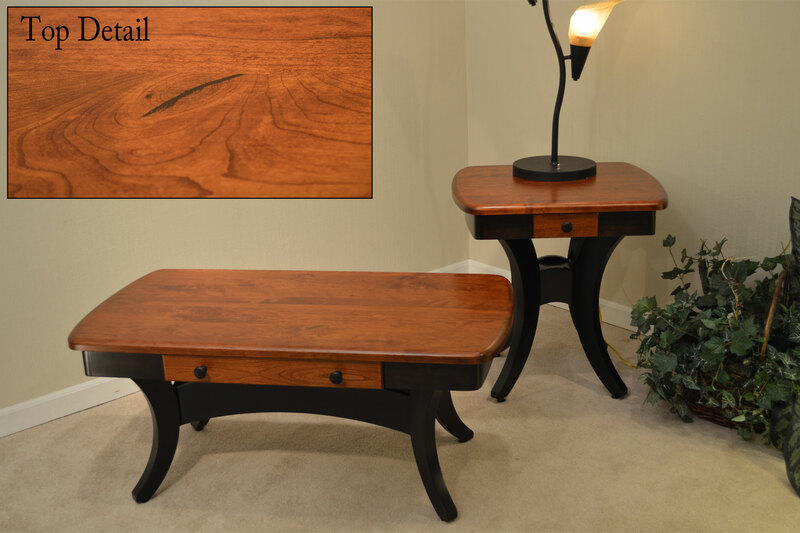 Sofa Table: H-29.5" W-42" D-18"
The occasional features large yet curved post legs. Tables shown also have a beveled edge although other edges are available. Drawers are optional in addition although shown on the end table of the group. Hardware for the drawers has almost limitless options with a full catalog available. 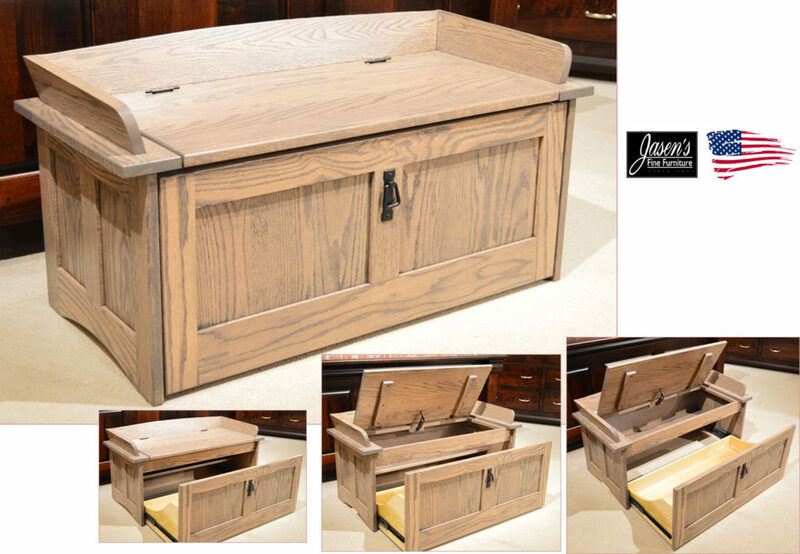 The solid wood construction is entirely made of rustic quarter sawn oak. Rustic quarter sawn oak, consequently has more variations such as knot holes and burls. 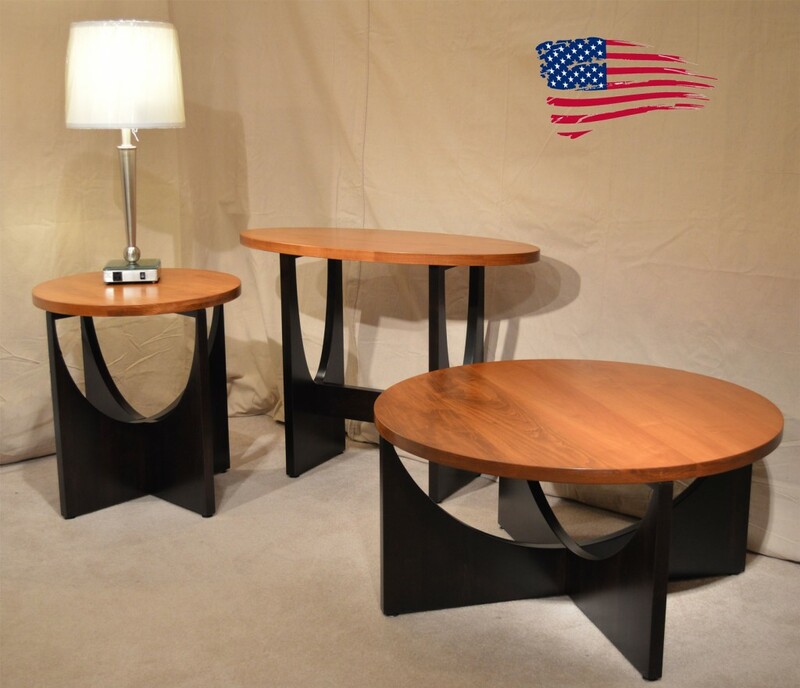 The tables also are available in other wood specie including oak, maple, cherry, and elm. Each wood specie also has a large variety of stains colors available. Sizes of the tables are customizable with almost limitless options. Furthermore the tables are Amish and hence made in the USA! 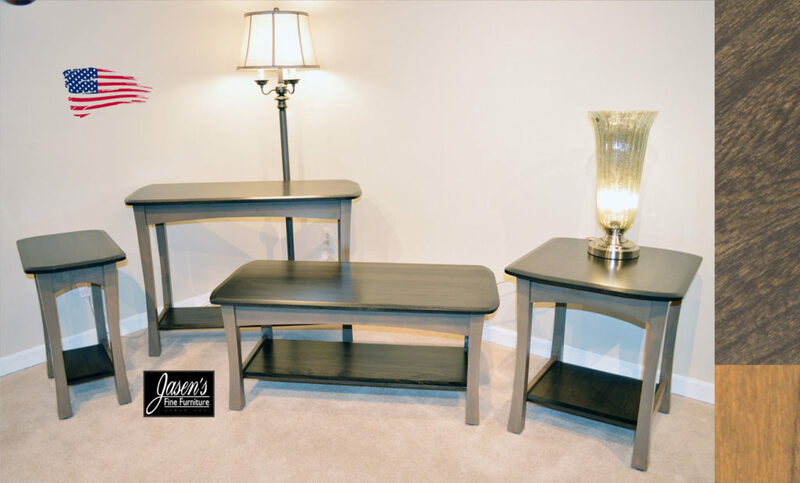 Round End Table: H-24.5" W-22"
End Table: H-24.5" W-22" D-22"
The tables feature solid post legs, full extension glide drawers, and modern gray stain. 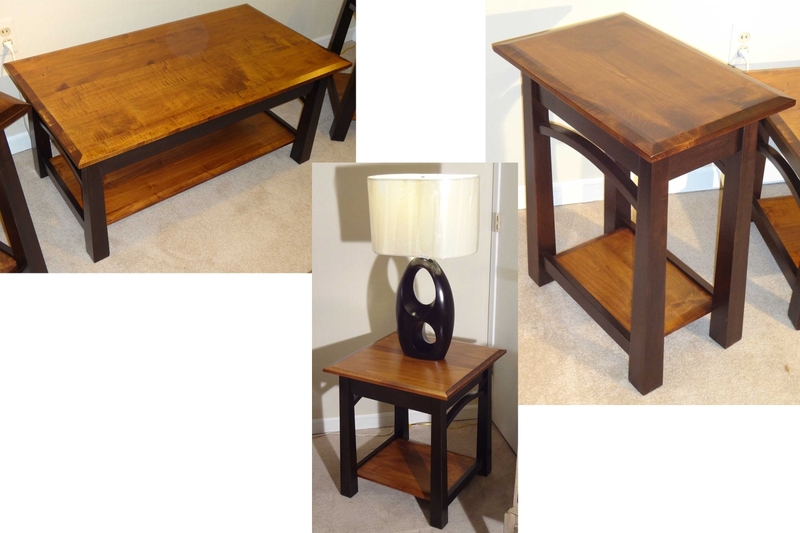 The pieces can be ordered in any wood specie and stain hence you will find the look that works for your home! The series is very modern, yet will lasts for generations for a complete heirloom style. 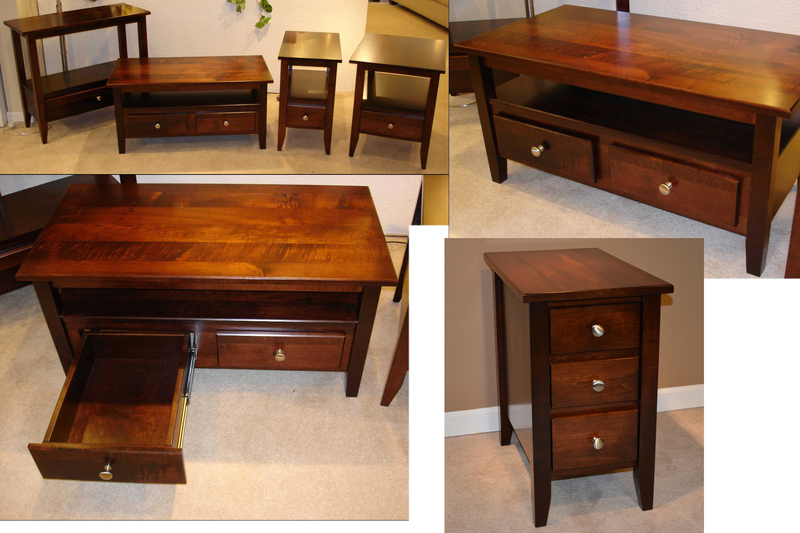 Furthermore, the tables can be ordered without drawers for a reduced price if needed. The wood species that are available include oak, maple, cherry, quarter sawn white oak, elm, walnut, and more! The hardware featured is a sleek black pipe-style pull that perfectly balances the square style of the set. 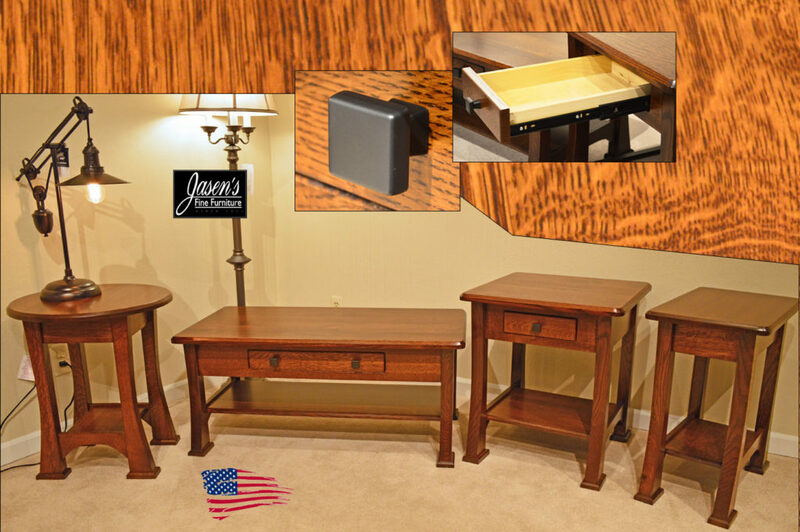 There are many hardware choices available upon special order if you want to personalize your tables even more! 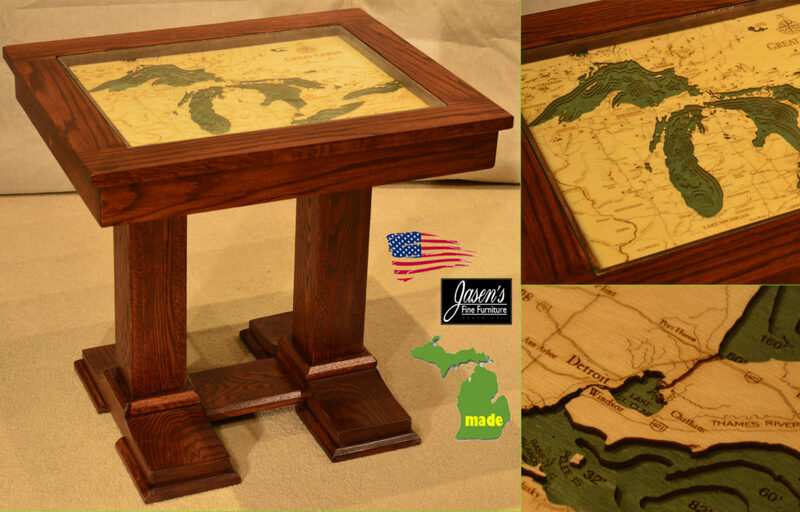 Since the tables are Amish they are all USA made! 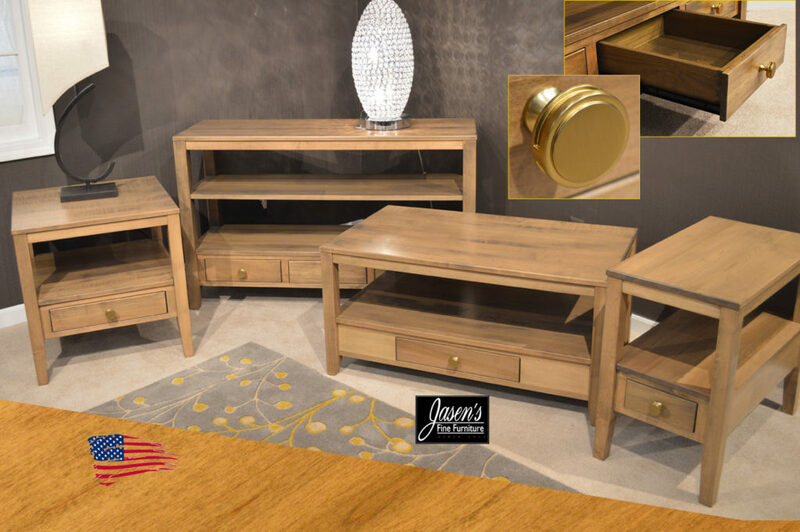 Tables feature curved bell shaped leg style and all solid brown maple construction, dovetailed drawers, and full extension glides for lifetime enjoyment. 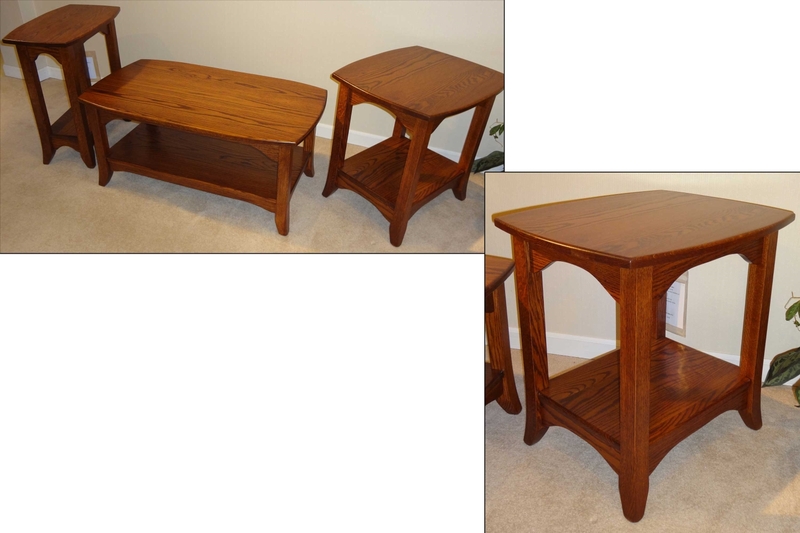 These heirloom quality tables can be ordered in any size, wood specie, stain, and hardwares of your choice. Made in USA! 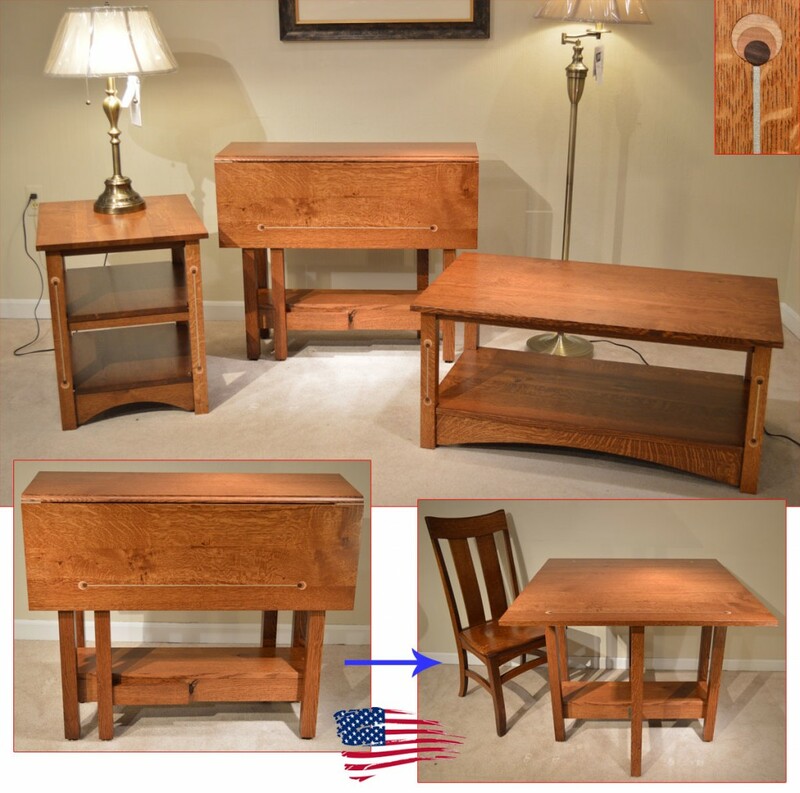 Small End table: H-22 W-20 D-22"
Large End Table: H-22 W-26 D-22"
Coffee Table: H-18 W-46 D-22"
Chairside table: H-24" W-16" D-22"
Coffee table: H-18" W-42" D-22"
End table: H-24" W-20" D-22"
Sofa Table: H-29" W-42" D-17"
Solid rustic quarter sawn oak tables feature mission styling, unique multi-wood inlays, and gate-leg sofa table that opens up to a small gathering table for your living room. 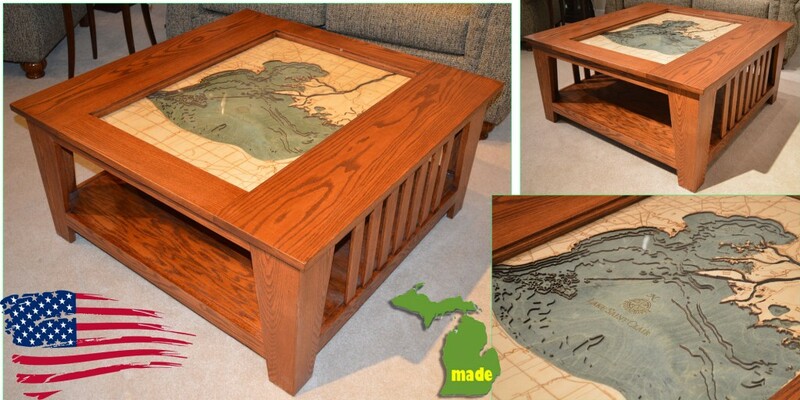 Available in a large variety of wood specie, stain, and custom sizing. Made in USA! Amish Round Tables. Space age styling meets solid wood to make this set as unique as those that decide to make it part of their home. 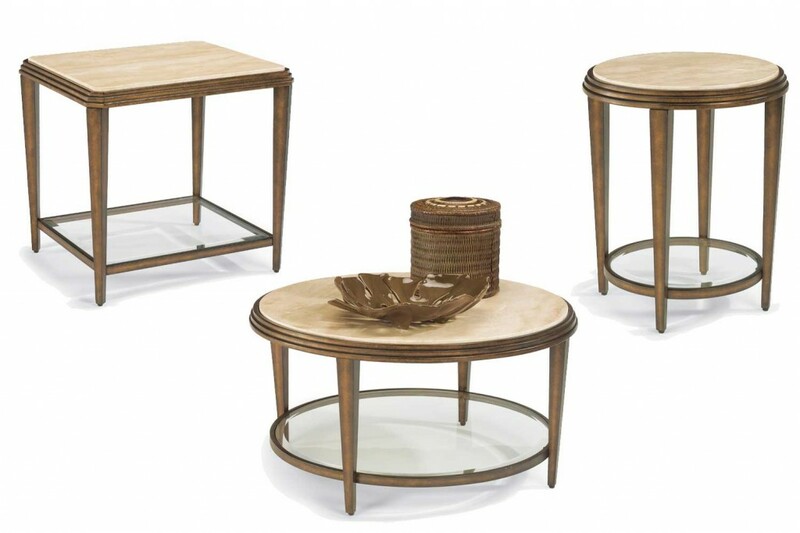 Tables feature futuristic styling, 1.25" tops, 4 point bases, and two-tone finish. Available in single tone, custom size, and any wood specie you desire. Made in USA! 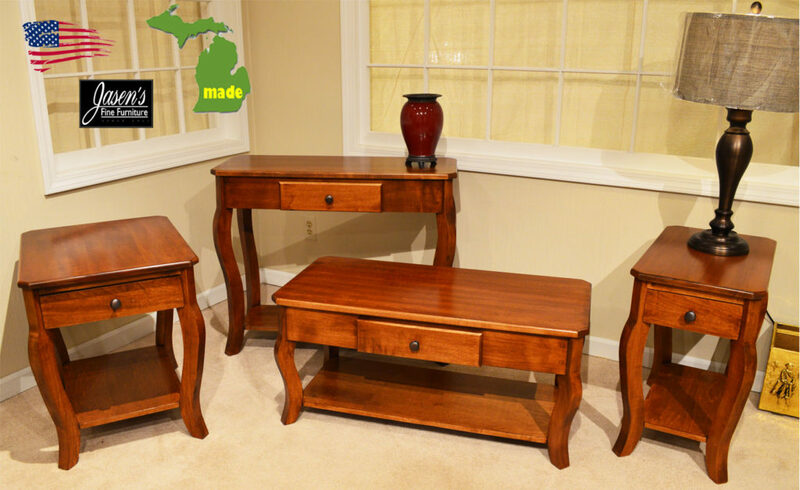 Sofa Table (mid) H-28" W-38" D-16"
Amish Turned Leg Tables. Shown in solid Brown Maple with unique wire twist hardware. 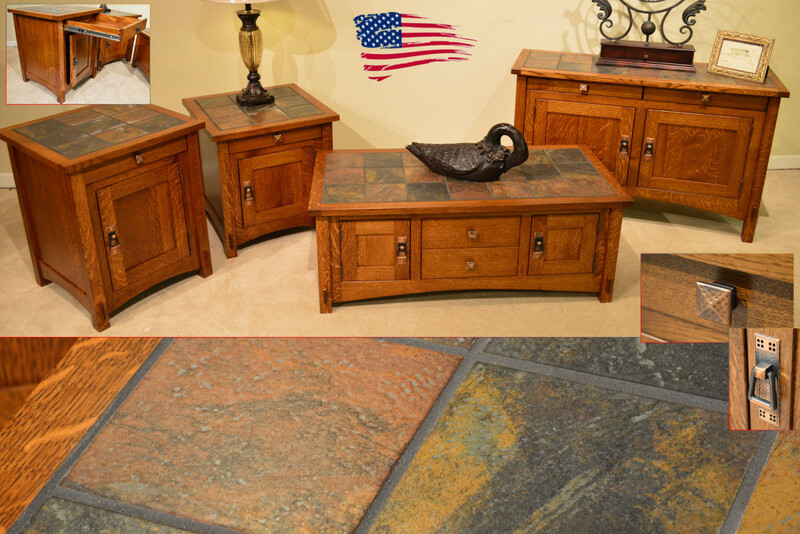 Distinctive turned legs add a traditional elegance along with the scalloped edges and 1.5" thick tops make this series perfect in any traditional home. One full-extension drawer is standard with each piece. Available in any size, wood specie, stain, and hardware of your choice. Made in USA! 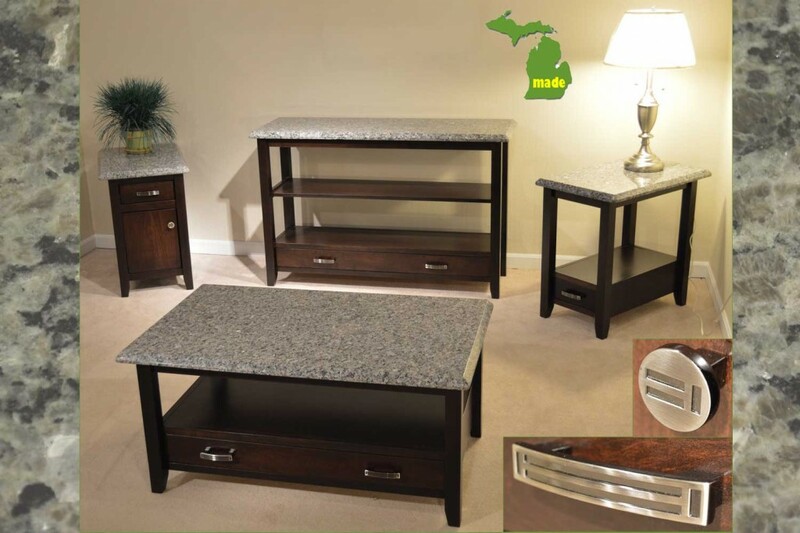 These tables are 100% Michigan made and will provide your living room with the durability and beauty of granite and the warmth of solid wood. Drawers are dovetailed on all sides, have full extension glides, and have contemporary handles and pulls. Made in Michigan! 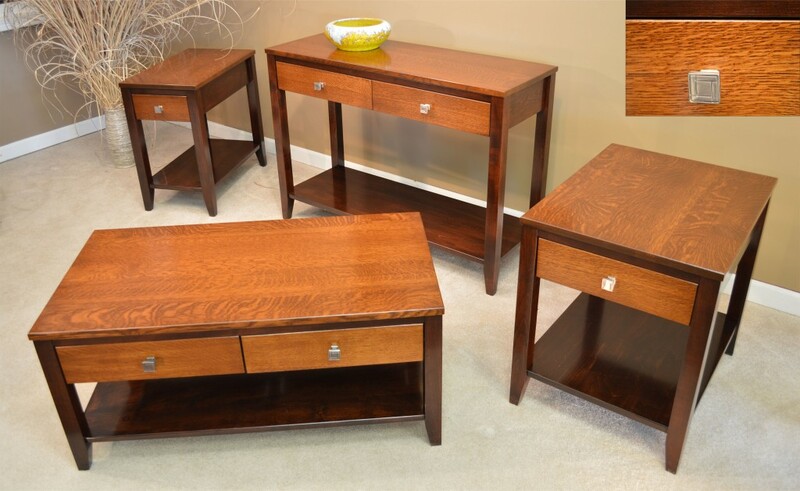 End Table: H-25" * W-22" * D-26"
Coffee Table: H-19" * W-48" * D-24"
Clean, retro lines are used in this set with solid tiger oak tops and drawer fronts. Brown maple is used in the frames to enhance and bring out the beauty of the tiger rays. Satin Nickel hardware is used to accent the contemporary theme and each drawer features full-extension glides. 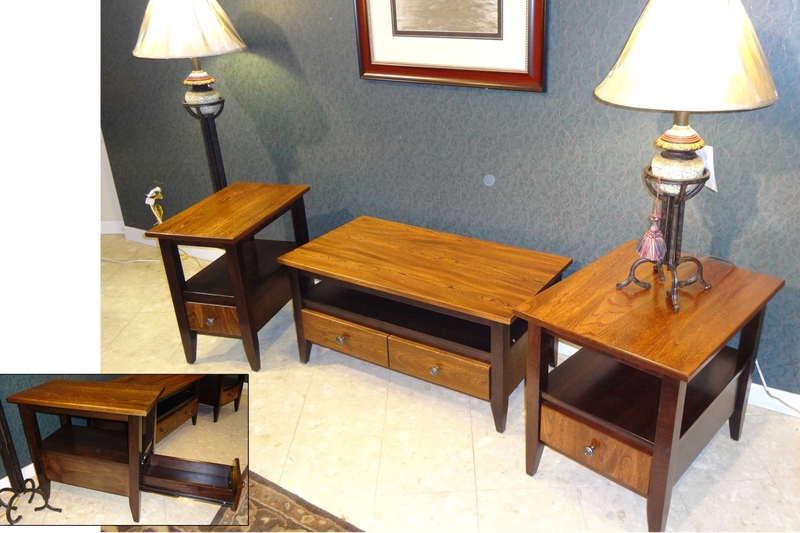 Pieces can be ordered in any DIMENSIONS you desire, 30+ colors with Oak, maple, Cherry, elm and more. Hardware can be selected from an extensive catalog. MADE IN USA!! 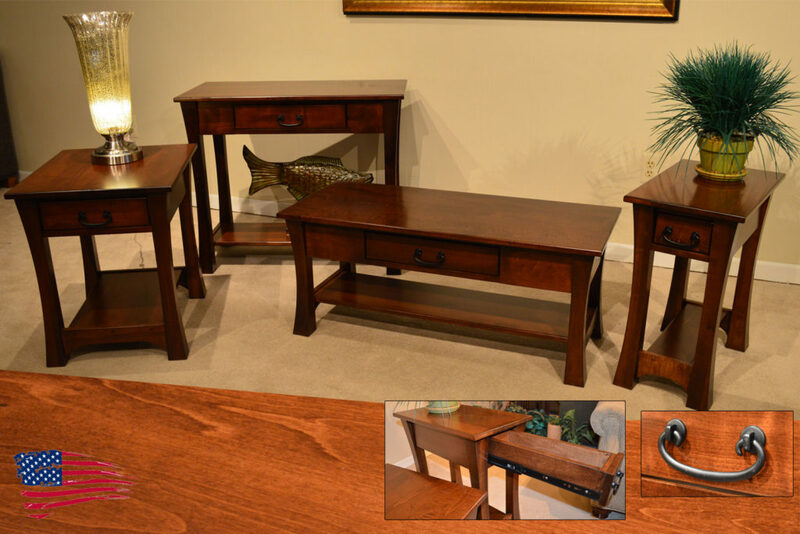 Amish Furniture Contemporary Tables. "Demilune Collection"
SOLID MAPLE; Onyx finish on Maple wood, reverse beveled edges, clean styling, and tinted glass/solid tops. 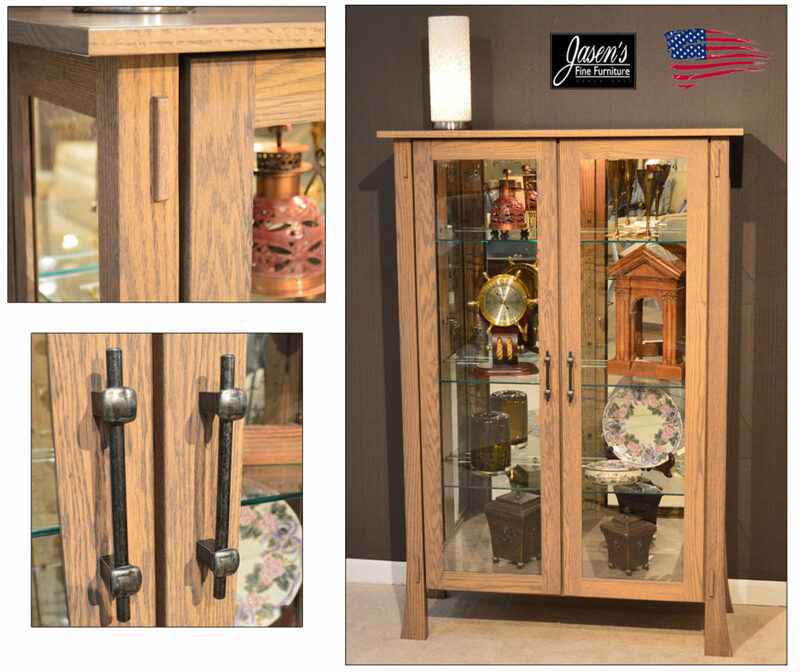 Pieces can be ordered in any DIMENSIONS you desire, storage drawers, clear glass, w/ or without bottom shelf, solid tops. 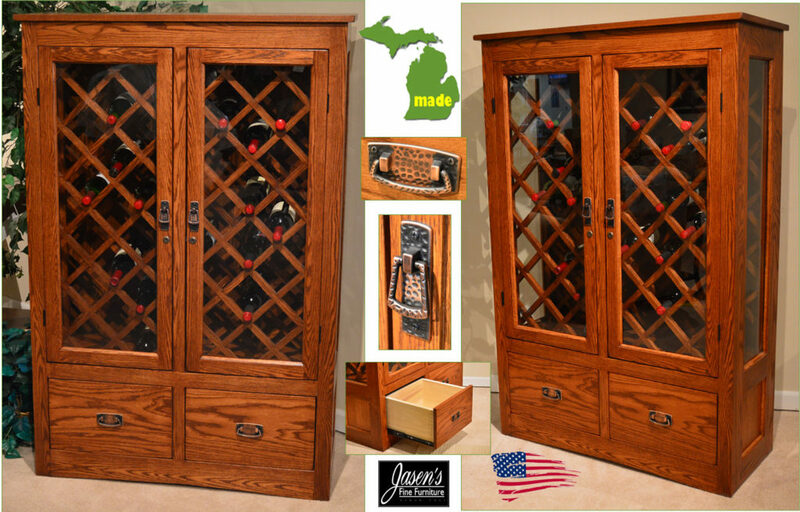 30+ colors with Oak, maple, Cherry, and with hardware selection from an extensive catalog. MADE IN USA!! SOLID MAPLE; SOLID ELM, Onyx finish on Maple wood, Michael's Cherry on Elm (top and fronts) brushed pewter hardware, clean styling, and smooth extension glides for each drawer. Matching Entertainment Console available. Click the button below. Made in USA. "Austin Collection"
Made in USA. 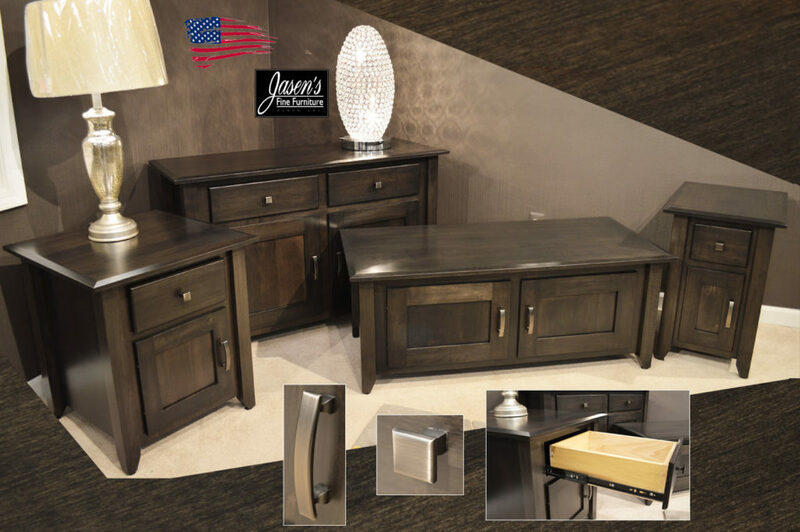 "Manhattan Collection"
SOLID MAPLE, Rich Cherry finish on Maple wood, nickel hardware, clean styling, and smooth extension glides for each drawer. Pieces can be ordered in any DIMENSIONS you desire, 30+ colors with Oak, maple, Cherry, and with hardware selection from an extensive catalog. MADE IN USA!! Made in MI. "Oak Sabre"
Solid Oak and plywood with ADC49 finish, ball glide tracks for full extension, transitional styling, Cocktail table has felted display drawer, and brushed nickel hardware. Pieces can be ordered in any DIMENSIONS you desire, 30+ colors with Oak, maple, Cherry, and 12+ hardwares. MADE IN MICHIGAN!